Supermarket group Morrisons has dropped into the red as a result of heavy costs incurred from integrating Safeway. Pre-tax losses for the first half of the year were £73.7m, compared with a £121m profit in the previous period. Meanwhile, like-for-like sales in the core Morrison stores fell 5.2%, excluding fuel, in the third quarter. The West Yorkshire-based firm bought the Safeway store chain last year for £3bn and has repeatedly issued profit warnings since then. The plunge into losses reflected £119m in exceptional charges which were signalled by the company earlier this year. 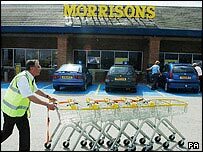 Before this figure, Morrisons posted operating profits of £50.7m, compared with £168.9m last time. However, the store conversion process will be completed by the end of this year, the company said, and full-year profits are expected to be towards the bottom its £50m to £150m range it previously forecast, after exceptional losses. This compares to profits of £320m for the full year in 2004. "The conversion of Safeway stores to Morrisons, and disposal of those that do not fit our operating model, has continued at pace. Converted stores saw a 23% increase in customers," said chairman Sir Ken Morrison. Ken Morrison said he was likely to remain chairman of the UK's fourth biggest supermarket chain for the foreseeable future. "I still enjoy the job which is one of the things that makes me want to stay," he said. Morrisons also announced it was replacing chairman David Jones with non-executive director Paul Manduca with immediate effect, confirming recent market speculation. Shares have underperformed the London food retailers' index by almost 14% this year.